It's that time of year again, the time when we all pause to reflect upon the progress of the New Order's mission to liberate highsec. We reconnect with our friends, our family, our Code, and our traditions. There's no finer tradition than the annual reading of A Highsec Christmas Carol, first published on MinerBumping two years ago. It's a Christmas miracle! Sasha Nyemtsov's classic audio version of A Highsec Christmas Carol has been digitally remastered and once again made available to the public. Gather 'round the fireplace, drink a toast to the New Order, and enjoy. Caution! Once you begin listening, you may have trouble stopping until all thirty-eight minutes have passed. Merry Christmas to all, and to all a good fight. 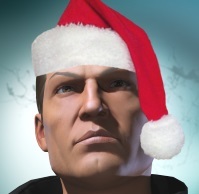 Merry Christmas, savior of Highsec. I wish glad tidings and compliance to all. Merry Code-compliant Christmas, everyone! Wishing you all a CODE-compliant Christmas! Another victory for the mighty Code Alliance and praise unto our supreme saviour! Anon 1:39, have a heart! Just think of all the poor miners out there who can't celebrate Christmas because they don't have a valid New Order Mining Permit (tm). All we want is for all of Hisec to be happy; not just a few. You always sound downsy when you say sheeple. Like a whining prick. Thanks for the holiday tears. "Stave 6, Scrooge rage quit and went AFK" that's awesome and hilarious! Hahahaha! Merry Christmas everyone! 50,000 shares purchased on behalf of the Permabanned Heroes of the Code? What a wonderful Christmas!